The law of Mendel states that the allele of gene present on the homologous chromosomes segregates during meiosis in such a way that each gamete get one allele not both. The genes in each parent are incorporated into separate gametes during gamete formation. The homologous chromosomes move towards opposite poles of the cell during anaphase I of meiosis. Therefore, the gametes have only one member of each chromosome pair. The allele of genes present on one member of a pair of homologous chromosomes enters into one gamete. The other allele of that gene is present on the other member. These alleles are segregated into a different gamete. There is random combination of gametes during fertilization. It brings homologous chromosomes together again. Wild-type fruit flies: They have normal wings. Vestigial wings: They have very reduced wings. One fourth has vestigial wings. The vestigial characteristic disappears in the F1 generation. But it reappears in the F2 generation. The ratio of wild-type files to vestigial-winged flies in the F2 generation is approximately 3:1. The cross with same characteristics but a reversal of the sexes of the individuals is called reciprocal cross. This cross gives similar results.
. Gene and alleles: Genes of a particular trait eXist in alternative forms The alternative forms of gene are called alleles. 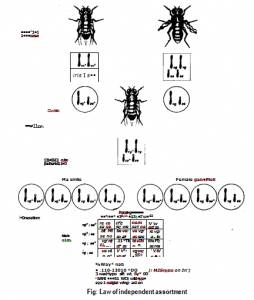 Dominant and recessive alleles: The vestigial allele is present in the Fi generation in the fruit fly. It is masked by the wild-type allele for wing shape. But it retains its uniqueness because it is expressed again in some members of the F2 generation. Dominant allele hides the expression of recessive alleles. The wild-type allele is dominant. It masks the expression of the vestigial allele. The physical expression of a gene is called phenotype. The physical expression of alleles does not indicate the genetic makeup of an organism. the same phenotype as one of the parents. But they carry both dominant and recessive alleles. So they differ genotypically. They are called hybrids This cross concerns only one pair of genes and a single trait. So it is a monohybrid. 5.Homozygous and heterozygous: An organism is homozygous . if it carries two identical genes for a given trait. Thus all members of the parental generation are homozygous. An organism is heterozygous if the genes are different. Only true-breeding flies are crossed. All members of the F1 generation are heterozygous. 6.Punnett square: Punnett square is used to predict the result of crosses. The first step is to determine the kinds of gametes. One of the two axes of a square is designated for each parent. 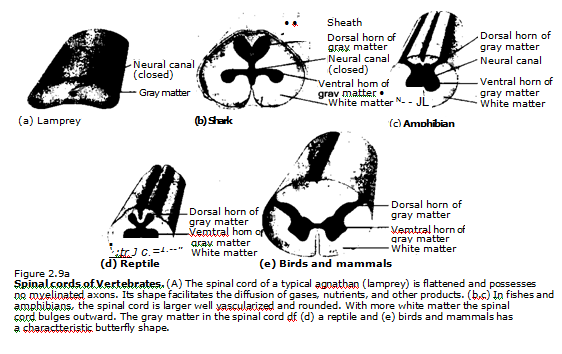 The different kinds of gametes are listed along the axis. The gametes are combined in the interior of the square. It shows the results of random fertilization. 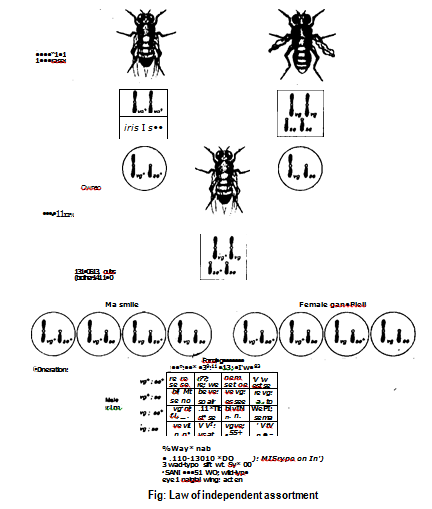 The figure indicates that the F1 flies are heterozygous. 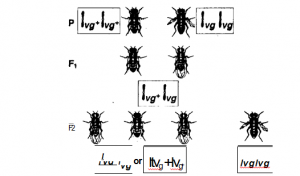 These flies have one wild-type allele and one vestigial allele. The two phenotypes of the F2 generation shows 3:1 ratio in Punnett square. The phenotypic ratio expresses the –results of a cross. This result is obtained from the relative numbers of progeny in each class. The Punnett square has thus explained in another way the F2 results in figure. It also shows that F2 individuals may have one of three different genotypes. The genotypic ratio expresses the results of a cross according to the relative numbers of progeny in each genotypic category. These are 1 vg + vg: 2 vg + vg: 1 vg vg. 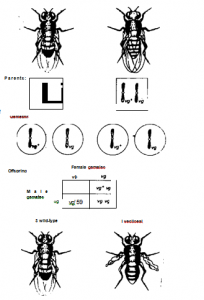 The flies in the parental generation are homozygous for each trait. Therefore, ach parent produces only one kind of gamete. Gametes have one allele for each trait. Fertilization takes place. 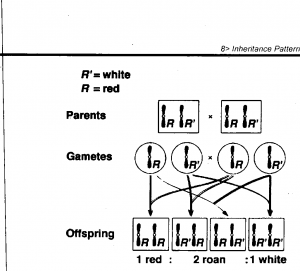 It produces offspring heterozygous for both raits. The F1 flies have the wild type phenotype. Thus, wild-type eyes are dominant to sepia eyes. The F1 flies are hybrids. The crosi involves two pairs of enes and two traits. Therefore, it is a dihybrid. he F1 hybrids are crossed to obtain F2. The F2 gives 9:3:3:1 ratio. It is a typical ‘hybrid cross ratio. This ratio shows that the alleles have assorted independently. Interpretation of independent assortment from meiosis he distribution of genes of one trait does not influence distribution of other gene during gamete formation. F1 gamete have vg gene for wing condition. It also has the se or se + gene for eye color. All the combinations of the eye color and wing condition genes are present. These combinations can form equally. This shows the principle of independent assortment and the pairs of factors segregate i dependently of one another. 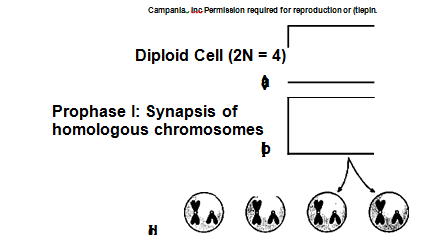 The steps of meiosis explain the principle of independent assortment. 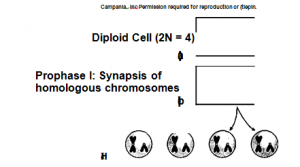 Meiosis reduces haploid daughter cells. These cells have one member of each homologous pair of chromosomes. The homologous chromosomes line up at metaphase I. They then segregate from each other. The behavior of one pair of chromosomes does not influence the behavior of any other pair. The maternal and paternal chromosomes are distributed randomly among cells after meiosis. Possible combinations of chromosomes in haploid cells after seg­egation of homologous chromosomes during meiosis I. All possible combinations of one member of each pair is represented. Meiosis II results in separation of chromatids but no further reduction in chromosome number. The presence of more than two alleles in a single gene in different combination is called multiple alleles. Normally two genes determine the traits i one individual. One gene is carried on each chromosome of a homologous pair. Some populations have many different alleles. They can transfer these alleles to any member of the population. These are called multiple alleles. Genes for a particular trait are present at the same position on a chromosome. e position of gene on the chromosome is ‘called its locus. Numerous human loci have multiple alleles. Three alleles, symbolized IA, 18 and i, determine the ABO blood types. The allele i is recessive to IA and to 18. IA and 18 are neither dominant nor recessive to each other. When IA and 18 are present together, both are expressed. The interaction between two alleles that are expressed more or less equally, and the heterozygote is different from their homozygote is called incomplete dominance. The phenomenon in which heterozygote expresses the phenotypes of both mozygote is called Codominance. In the ABO blood types, the 1A, IB h terozygote expresses both alleles. e ample: E. coli bacterium lives in the changing environment of a human gut. It d pends in its host for nutrients. (a Sometimes, its host does not provide it tryptophan amino acid. This amino acid is necessary for its survival. Therefore, the bacteria activate its genes of tryptophan synthesis. It-stimulates the metabolic pathway to make its own tryptophan from another compound. (b Later, if the human host eats a tryptophan-rich meal, the cell stops producing tryptophan for itself. It saves the cell from wasting its resources to produce a substance. This substance is now available in the surroundings solution. Thus it stops the expression of genes of tryptophan. It shows that the environment directly affect the expression of tryptophan gene. Cells can vary the numbers of specific enzymes. Thus the cell can regulate the expression of a gene of that enzyme. For example, end product inhibits the activity of the first enzyme of the tryptophan synthesis pathway. Thus, if tryptophan accumulates in a cell, it shuts down its own synthesis. It is a feedback inhibition. It allows a cell to adapt to short-term fluctuotions in levels of a substance it needs. If the environment continues to provic.7 all the tryptophan the cell needs, then regulation of gene expression also cores into play: The cell stops making enzymes of the tryptophan pathway. Tnis control of enzyme occurs at transcription level. The synthesis Of messenger RNA coding for these enzymes is stopped. Thus many genes of the bacterial genome are switched on or off by changes in the metabolic status of the cell. It is the basic mechanism for this control of gene expression.